The first lady earned six figures from an agreement with Getty Images that paid royalties to the Trumps and mandated photos be used in positive coverage. 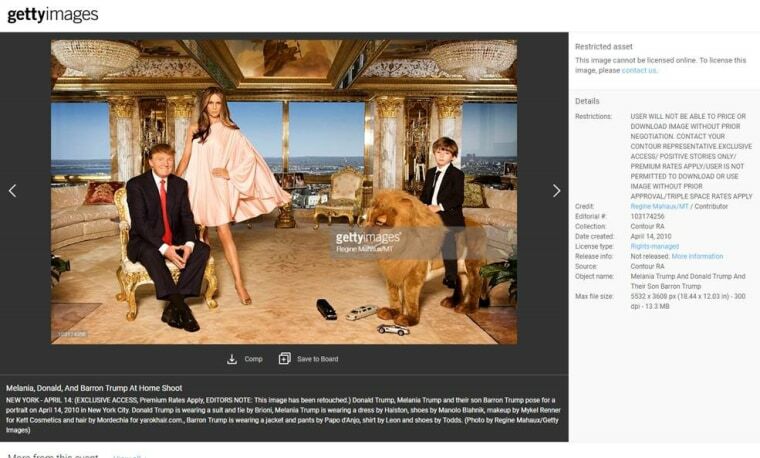 A screen shot shows how an individual Mahaux photo of the Trump family appears on the Getty Images website. A photo of Barron and Melania Trump taken by Regine Mahaux and licensed via Getty Images was used in a 2016 NBC Nightly News segment. Fox News used the photos in a variety of news segments in 2016. Greta Van Susteren's show "On the Record" included two portraits of Melania Trump during an interview Van Susteren did with the future first lady. In November 2016, after Trump's upset election win, the first episode of the Fox News show "OBJECTified," hosted by TMZ founder Harvey Levin, depicted the life and rise of Donald Trump. The episode included two of the images taken by Mahaux. A screenshot of a My San Antonio/San Antonio Express article featuring a Regine Mahaux image of Melania Trump. My San Antonio took the story down after an inquiry from NBC News. A 2017 calendar featuring Donald, Melania and Barron Trump was offered for sale at the White House gift shop, and included a Regine Mahaux photo. A portion of the gift shop's revenues is donated to rural police departments. Paying royalties to the Trumps and limiting the use to only positive stories is unusual for news organizations, according to Akili Ramsess, executive director of the National Press Photographers Association. She said that celebrity wedding or baby photographs are sometimes licensed so part of the fees flows back to the celebrity. Keith Major, another Getty photographer who has also photographed Melania Trump, said he does not share royalties with her.